Kylie Jenner's fans believe that reality star could be pregnant with baby number two. Is Stormi Webster going to be a big sister already? Apparently, fans are convinced her momma Kylie Jenner might be pregnant again. Well, thanks to these old wives tales. 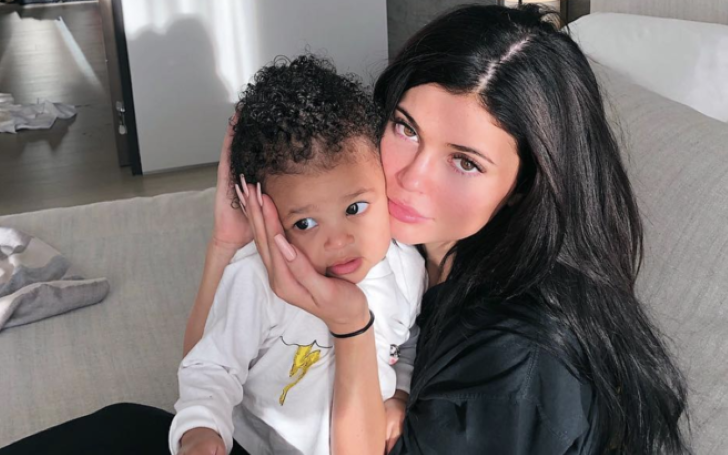 Just a couple of a few days ago Jenner continuously shared an adorable video and a picture of her beautiful baby girl, and since then the fans of the 21 years old star immediately came up with superstitious but somewhat convincing theories that a sibling, perhaps a little sister might be on the way soon for Stormi. Fans theories might sound interestingly crazy but we suggest you guys actually listen to what they had to say. Kylie Jenner and her daughter Stormi Webster takes a sunbath on a sunny day. Okay, moving onto the posts shared by Jenner to her 129 million Instagram followers; the first post showcases her one-year-old mini-me daughter holding on closely on her body as the two relaxes whilst taking a sunbath on a beautiful sunny day. The youngest self-made billionaire captioned the nine million times liked picture saying: "my baby is stuck to me like glue lately🖤"
Similarly, the second post appears to be a video of the momma daughter duo cuddling on the same spot in the same position. And apparently, little Stormi can now talk too. How adorable. Although Stormi can't speak fluently yet, she preciously replies to her mother with a simple yet cute "yeah" when the reality star donned in a black one-piece swimsuit tells her: "Girl! You’ve gotta do things without me!" The beauty mogul captioned the video with: "i love our little conversations 🧸💛 💛💛☀️"
Well, based on fans theories, it's believed that when a baby clings to their momma, it sometimes can represent the sign of a mother being pregnant with another child. However, though, aren't babies usually clingy to their mother, like always? Also, it's not just a single or couple of fans who assume Kylie's second pregnancy. Instead, there existed hundreds and thousands of fans who believe it and in results, they didn't even hesitate to shower the comments with their opinions. "I just said this she made a statement to Strom is sticking to her I put on page that back in the days older people said when a child is on you like that they know they are getting out of the way of another child"
"U have to be super sliw not to see tbe bump she hiding with her atm covering her mid section..i am positive she preggo!" Whereas, on the contrary, Kylie is yet to respond to her fans on the pregnancy speculations. Such news regarding her pregnancy surfaced last month too. However, at the time Jenner clearly declined the rumors. Well, it's no surprise that Jenner who keeps her personal life super lowkey would share such things to the public, not forgetting to consider how she successfully hid her pregnancy with Stormi. Likewise, we reported last month that Kylie and her partner of two years, Travis Scott got into a huge argument after Jenner found her rapper boyfriend sliding into some girls DM on Instagram. The matter evolved so big that it led to Travis postponing one of his concert dates. Unsurprisingly, Jenner didn't speak publicly on the matter at the time either. As a matter of fact, Jenner has not even publicly respond to the scandal that involved her best friend Jordyn Woods who was found kissing her sister Khloe Kardashian's then-boyfriend Tristan Thompson in a private house party. Kylie Jenner Spotted Wearing a Giant Engagement Ring at the Super Bowl; Is She Engaged To Travis Scott?